Unseemly Science is the second novel from The Fall of the Gas Lit Empire and is much darker than the first, (The Bullet Catcher’s Daughter). This Steampunk mystery had me gripped from the first page. Elizabeth Barnabus, still an outlaw and leading a double life in the persona of her brother, Edwin, (who I would have liked to have seen more of) is joined in her quest by her good friend, Julia Swain and orphaned ragamuffin, Tinker. Elizabeth discovers that an extradition treaty between the Kingdom and the Republic is imminent and a few contemptible characters try to manipulate her for reward. Whilst evading the authorities, she finds herself involved in a sinister plot that grows increasingly dangerous. Some gruesome scenes are disturbing in this compelling tale and Miss Barnabus faces trials and tribulations with grit and determination. It was pleasing to see an old adversary turn ally. The writing is superb; tight and pacy and Duncan’s ability to engage a reader in this fantasy world by feeding their imagination in a way that distorts the real, and yet gives a sense of realism, is skilful. Each chapter heading is extraordinary, and accomplished. 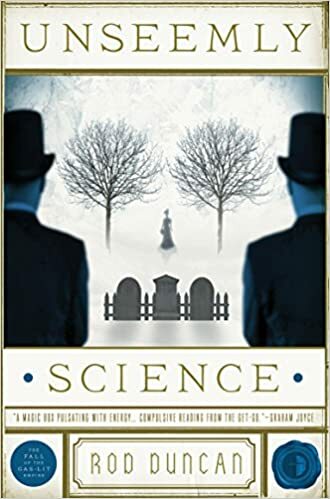 As with The Bullet Catcher’s Daughter, before embarking on Elizabeth’s journey in Unseemly Science, it helps to read The Glossary as a number of surreal things are revealed to help understand Duncan’s alternate history of the Gas Lit Empire. Unseemly Science and The Bullet Catcher's Daughter are published by Angry Robot, and available in both paperback and e-book formats. The third novel from The Fall of the Gas Lit Empire is Custodian of Marvels.